It is scary that technology used to rummage through Chernobyl is also used to measure how radioactive thyroid cancer patients become during our treatment. I have twice gone through Radioactive Iodine 131 treatment. The second time around I had a boyfriend who worked at Lawrence Berkeley National Laboratory as an astrophysicist. He stole a Geiger counter from work to measure how many rads I was throwing off. He turned off the sound so I wouldn’t be upset by the auditory reminder that I was a walking wasteland. I have become friends with Leela on myplanet – a social networking site for young adult cancer survivors. The sound on her video blew me away and I wanted to share it with you. Have you ever wanted to protect yourself from too much information? Have you asked people to not share with you test results, or numbers that might blow your mind? Odd…I do not know how far advanced Leela’s thyroid cancer was, but I was diagnosed with it about four years ago, at age 35. To this day, even though I had the thyroidectomy and the radioactive iodine and still visit my oncologist twice a year, I do not really conceive of myself as a “cancer patient”….as I never went through chemo and my treatment was neither as dramatic nor as grueling as those who have “real” cancer. As in, I feel like a bit of a fraud reading your blog. Or, at least as though you are writing about a group that I am not a member of. Thanks for your comment. My experience is that you are not alone in these feelings. 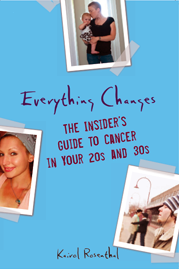 While researching my book, I spoke with dozens of 20 and 30-something cancer patients throughout the U.S. Regardless of their diagnosis and disease type, many of them felt like “frauds” because they could always find someone who had been through worse hell. I’m talking stage III breast cancer patients feeling like they didn’t really have cancer because they were not yet arranging hospice. I like best the perspective I got from an interview with Julie Larson, the Young Adult Social Worker at CancerCare. She says not to compare your health experience to other patients, but compare it to your life before cancer. How is your life altered by this experience? When I was diagnosed with thyroid cancer I had mountains of health insurance paperwork and bills, side effects from surgery, an increased risk of secondary cancer from RAI 131, and the fear of recurrence (which unfortunately came true). For me, that was quite a change from my life prior to thyroid cancer. But that is just my experience. What is important is yours. If you feel like you didn’t really have cancer, then you are lucky. And it certainly does not make you a fraud. Interesting….. Nice to know that I am not the only one with this point of view. For me, the worst part of the cancer was not the surgery–it was the six weeks of being off hormones and the resultant really awful, hellish, depression. Regarding the issue of recurrance, I go for bi-annual checkups, but for some reason it really has not sunk in that the cancer might come back (bit of a disconnect). I had a bit of a shock a few months ago. I was chatting with another patient in the waiting room while waiting for my oncologist. When I told her that my treatment was three years ago, she responded “oh, you are in remission”. Me: “Ummm…well I prefer to think of it as cured.” As in seriously, that is how my mind sees it. When I finally got into my doctor and asked him if I were in remission or cured, he made some comment about how we should not get into semantics…. Right. So I am cured. Foolish, yes, but hell, if it is going to come back it is going to come back. So long as I make the checkups, otherwise I may as well live in happy-clappy denial until then. As for pre- versus post-…. I had gone through a bombing three years before, so the whole thing gets rather complicated, to put it mildly. I blogged the whole thing, on a now hidden blog. One of these days I will go back and reread it.